Stay & Play at Pio Pico RV in Southern California! 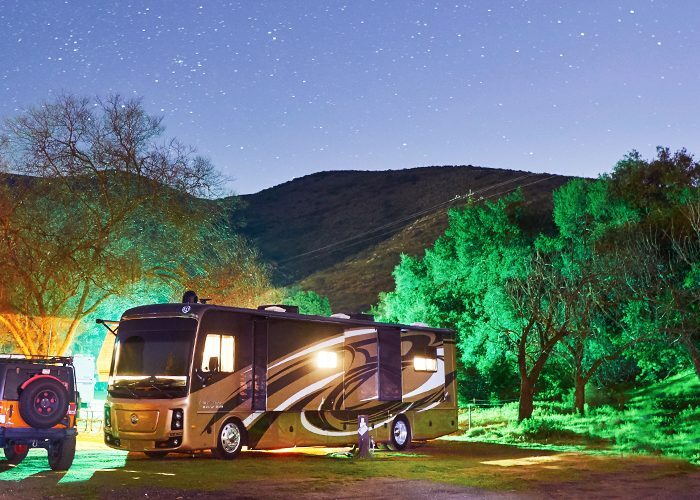 When you’re looking for a peaceful place to park your RV for the winter, Pio Pico is it. Come for the peace and quiet and spend your days in nature instead of the concrete jungle. You don’t even have to leave the campground if you don’t want to. As a sister campground to Encore RV Resorts, many travelers stay at Pio Pico RV Resort and Campground the entire winter. Spend your days exploring the rolling hills or walking beside a gentle flowing stream. There 180 acres of preserve here to ensure Mother Nature gets top billing. video and rediscover who you are. embers come and sell their wares and socialize with other resort guests. There are several hiking trails and canyons to explore and when you get back, there are two heated pools to relax in. For those who like a bit more water activity, there’s year-round water aerobics. Other activities include shuffleboard, mini golf, horseshoes, volleyball, bocce ball, basketball, tennis, billiards, softball and pickleball. The Pio Pico RV Resort and Campground is pet friendly. There’s even a dog park where your four-legged friend can meet up with fellow canine travelers for a sniff and greet and to chase few well thrown balls. San Diego is great for spending the day exploring the area, visiting the ocean and getting some great shopping in. Go dip your toes into the beautiful Pacific Ocean and explore the many different beaches here. There’s also the beautiful Sea Port Village for shopping right on the bay, and lots of great events. The Living Coast Discovery Center, a little over a half hour from the RV resort, is a great place to spend the day. You’ll have up close experiences with local wildlife including rays, sharks, owls, hawks, falcons, reptiles and the endangered Green Sea Turtles! There are over 20 museums nearby including: the San Diego Air and Space Museum, the Bonita Museum and Cultural Center, and the HMS Surprise Maritime Museum. You’re a half an hour from the border when you stay at Pio Pico. Venture out for a day in Mexico and enjoy everything Tijuana has to offer. Time spent at Pio Pico would not be complete without a visit to Balbo Park. Museums, performing arts, a miniature railroad, the United Nations Building and the San Diego Zoo are all located on 1200 acres. There are several restaurants and fast food eateries nearby. Most are within about a half hour drive. Try some Italian food or burgers and beer up in El Cajon. In Chula Vista there’s pizza, Mexican and Chinese food. San Diego has more restaurants than we can list here. Suffice it to say, if you have a craving, there’s a very good chance they have a restaurant to match that craving. There are so many places where you can take in a play a short drive from Pio Pico RV Resort. San Ysidro Performing Arts Center is 25 minutes from the RV resort and hosts local community events and professional theater productions. There’s also a blackbox theater and orchestra pit. The Balbo Theatre in San Diego is about a 40-minute drive from Pio Pico. This historic venue was named one of the world’s 15 most spectacular theatres. For something a little different, check out the plays at the Moxie Theatre. Most of the plays they produce are from primarily female playwrights. At the end of the day you’ll be happy to head back to Pio Pico, knowing you’ll awaken to the sounds of nature and a new day with so much more to explore. Want to visit Pio Pico Rv Resort? Let us know in the comments !